Want to start a food blog? Here’s is a simple and easy way to create a food blog website and share your culinary ideas and establish yourself as a food blogger/chef. The Internet has answers for everyone’s questions, even for those looking for new recipes. If you love cooking, then there are a lot of people out there wanting your guidance while they step into their kitchen. And we have to admit, in this age of technology, food, and recipe blogs have totally replaced the cookbooks. Now everyone looking for recipes look for it on the internet for the latest recipes. So why not start your own food blog and share your delicious recipes with others. You can share your ideas, recipes, and show you culinary skills through your cooking blog. With your recipe website, you can establish yourself as a professional food blogger and get recognition among the community. You can run your food blog in association with some other channel like a YouTube recipe channel, an Instagram page, etc. Once your food and recipe blog starts getting enough traction, you can find different ways to monetize it. So your website can make you money. Besides the ones mentioned above, there can be many other reasons to start a food blog. And there’s no reason to wait anymore, since creating a food & recipe blog is so easy. With the method shown in this article, you can start a food blog on your own, in just minutes. No need to hire experts, or a web-manager to get your site live and maintain it. This is the DIY technique to create a food blog and manage it on your own. For any website, you will need the domain name as well as the hosting space. There are several web hosting companies and domain name providers from where you can get them. First of all, decide on your domain name. The domain name is your website’s unique address and identifier on the internet. Keep it short, simple and easy to remember. Go for names where the users are less likely to misspell. The domain name must represent your website rightfully. Avoid names that can violate the copyrights of others. Choose a name that is unique and not resembling some other blog or site. Also, make sure you pick the domain extension carefully. Here’s an article that can really help you pick a smart domain name for your food blog. Also, while you decide domain name, don’t stick to just one. Make a list of 4-5 domain names that you would like to have. Since the domain name is unique, if your domain name is already taken by someone else, you will need some other alternative. Now when you are ready with the domain name, you can head to procure it. There are several domain name providers like GoDaddy, Bluehost, Namecheap, etc. As shown in the image, you must enter the name you want in the search bar, choose the domain extension and press search. If the domain name is available, you can check out for it. Once the payment is complete, you will receive an email with the password where you can log in with your email and use the domain name for your site. Now that we have a domain name of your choice, it’s time to rent space for your website’s hosting. There are multiple hosting companies that provide affordable, fast and efficient hosting facilities for your website. To choose an efficient host, you can research in your local region and ask fellow bloggers for their opinions on what the host works for them. Or you can read the several hosting reviews available on the internet and choose the one that you thinks fits the best. We recommend Bluehost for all your hosting requirements. Many of Templatic users already use BlueHost and have some very nice things to say about their services. Moreover, their WordPress optimized hosting makes sure your WordPress website runs smoothly and securely. You can, therefore, register on your the hosting company’s website, and choose the plan that fits the best and pay for it. With the password provided, you can log in to your hosting space and install WordPress. Most of the advanced hosts will let you choose the platform for your website. And when you choose WordPress, it will automatically install WordPress for you on your hosting space. If you have chosen the WordPress hosting, WordPress will come pre-installed and all you will need to do is start creating your food blog. WordPress is designed for blogging, in fact, DIY blogging. It provides the best framework to launch your blog even if you are completely new to the technical world. The learning curve needed to create a food blog on WordPress is almost nil. The dashboard comes with all the intuitive options that you can use to make your site look and work the way you want. WordPress themes are here makes your task easier. The internet is full of attractive, professionally designed and programmed WordPress themes to create your food blog. WordPress provides you the scalability for your website in form of plugins. Adding and removing features is so easy. For instance: You run a recipe blog, but now you want to sell snacks on your site. It is possible with the WooCommerce. Just install the plugin, and your WordPress site turns into a full-fledged store. Need more extensibility? WordPress is open source and if you need advanced features into your site, it is totally possible. Before you start looking for a WordPress blog and recipe theme, be sure about what you want. Make a list of the features you want and the kind of design you are looking for. There are themes with special post type for recipes to give you a better understanding and easier experience. There are also themes with front end recipe submissions. You can choose a theme as per your requirements. 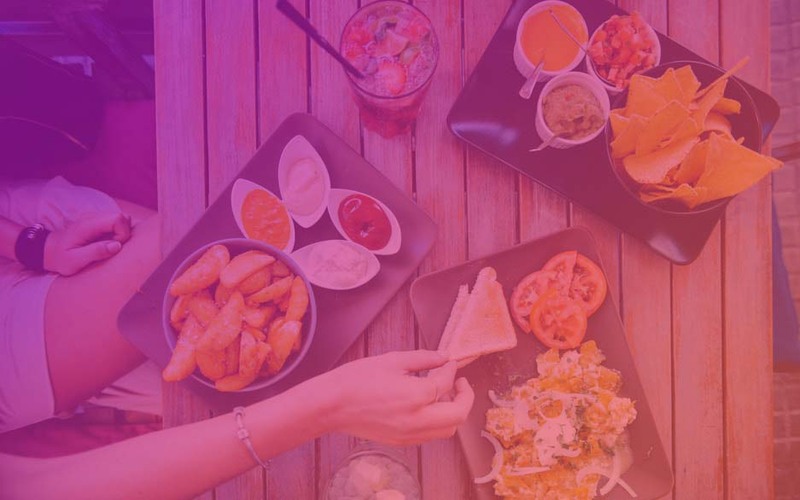 For this article, we will use the Food Blog theme to start a food blog website with WordPress. This is a premium WordPress theme, specially crafted for enthusiastic food bloggers to start right away. You can search the internet for the best Food blog theme, and follow the process to buy it. Once you make the payment for your theme, you will be allowed to download the theme and provided with a license key to use it. Download the zip file for your theme and now it’s time to install it. Installing the WordPress theme will configure your WordPress site with the design and the features the theme is built for. 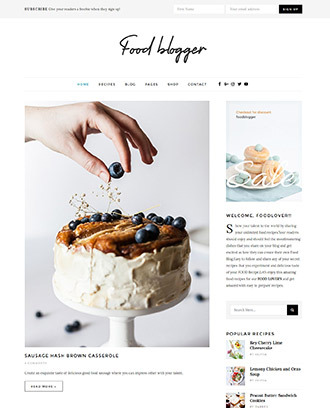 The food blog WordPress theme comes with a professional and strategic design, a special post type for the recipe, and some pre-designed pages to get started. However, it is completely flexible, you can change how your website looks and works with the available back-end options. So, to install the theme, navigate to the Appearance section on your WordPress dashboard, and click on themes. You must choose the upload theme option. This will allow you to choose the theme and upload it. Once uploaded, you can activate it. With these steps performed, you have successfully uploaded the theme. Next, you can provide the license key when asked for. Just copy the number and paste it into the prompt box to verify your theme. Activating the theme will not yet make your site look like the food blog theme demo. To make your site look exactly like a live site you can see on the theme demo, you must complete the steps at the setup wizard. You will be taken to the setup page as soon as you activate the theme. The setup wizard is a step by step process to install the required plugins, update the site with sample data and other configuration processing. On the successful completion of the setup wizard, your site will be ready. All you need to do now is to personalize it to make it look and work exactly the way you want. You have installed WordPress, installed the theme and now your site is populated with dummy content. Having it configured with the sample/dummy data is good to get started. Because it will guide you better to start a blog. And with the help of the sample data, we will personalize our site with the content that provides value for the users. Page building and restructuring were never easier. Thanks to the drag and drop page builders that make designing your pages a breeze. The WordPress Food Blog theme is compatible with the free and efficient Elementor Page builder. The page building options by Elementor includes pre-designed layout elements and an easy drag and drop editing interface. so you can not only easily create the pages you need with the design you want, but also edit the existing pages. Add all the sections you want, or change or delete them. Because the page is built by individual elements arranged together, customizing each element of the page is possible. The food blog WordPress theme comes with the essential pages pre-designed, and you can easily edit it using the Elementor page builder. And with the drag and drop options, you can create all the pages that you want. When you start a blog, you must be sure about all the categories for your blog. If not, make a list of all the categories and sub-categories you want to cover through your food blog. Once the list is ready, you can navigate to the recipes section on your food blog website. Create all the food blog categories and subcategories you need. Also, don’t forget to show the categories on the homepage, either through a widget or through menu links. Menus on your blog are very important since they are the primary means of navigation on your site. So before you actually implement the menus, make sure all your important pages are linked through it. For this, you can make a list of all the important pages, and then classify them as menus and submenus. This tutorial about how to create menus in WordPress will help you on how to implement the menus on your site. The Food blog WordPress theme comes with a pre-built homepage. However, this does not limit your options. The homepage of the food blog theme is designed using the Elementor page builder and you can edit it using the same drag and drop options. You can easily change the sections, add more sections, remove them, etc. So you can redesign the homepage of your site as per your requirements. The reason for you to start a blog, it’s purpose and the content of different blogs can be different. The homepage of the blog must be intuitive enough to explicate your website’s true essence. So if you decide to restructure your homepage, you must do it carefully and make sure that the homepage doesn’t fail to explain what your website is all about. While you start a blog, there can be many other steps depending on what kind of website you want to create. However, the ones mentioned above were the steps to create a simple blog site. There may be some extra steps based on your niche. Once you feel like your site is ready for content, you can start adding blogs/recipes. Since the WordPress food blog theme comes with a special post type for recipes, it makes your task of creating a recipe blog really easy. It’s so much more than to start a blog site and posting recipes. You also need to promote your site to make sure that the content you write is actually reaching the targetted readers. After all, even the first class content on your site is only useful when it reaches the relevant readers. There can be multiple ways to promote your food blog. You can either engage a digital marketing agency at the initial stage to make your site known to the people. Alternately, you can try these simple promotional techniques on your own to promote your food and recipe blog site. The increasing influence of social media on our day to day life makes it one of the biggest platform for delivering your messages to the people at large. You can use different social media platforms to promote your recipe blogs. Also, make sure you inspire people to give your post a share so that it can influence more people. Make sure the theme you use is Social media ready. Even if it is not, you can use one of the social media integrations for WordPress. There are many plugins available for WordPress to make your site social sharing ready. The WordPress Food blog theme is completely social media ready and allows you to create a social media friendly food blog website. Alternately, you can also rely on paid social media advertisements. This is one of the best options for you if you are ready to invest in your food blog’s promotions and want quick results. This is the way to go if you want quick results. You can rely on paid promotions through Social media or Google itself. These kinds of promotions bring almost guaranteed results. It is a good method to get a headstart. It is always good to have some organic traffic, or at least you can put in the efforts to gain some when you start a blog. It is actually not very easy to score a search engine rank and attract people through popular search engines for a new blog, but you can only make a mark if you try creating a search engine friendly website right from the start. The following are some of the smart steps to take if you want to create an SEO friendly WordPress food blog website. Use the WordPress SEO plugins like Yoast SEO, All In One SEO, etc. If you think the SEO of your website, is too much for you to know and learn, you can hire SEO experts and have them optimize your website for the search engines. Ultimately, the SEO of your site is one of the most important factors and should not be ignored at any cost. Once your website starts getting deserved attention, you can start thinking of ways to make money through your site. It is obvious to expect something in return for all the hard work and efforts you put in for your recipe blog. Below mentioned are some of the simplest ways through which you can make money online. Google AdSense is a smart way to advertise. Instead of delivering static advertisements to all the people coming to your site, you can show targetted advertisements based on the users’ search history and the cookies stored in the browser. The Google AdSense makes it possible. It allows you to display advertisements relevant to your audience. All you need to do is to create an account with Google AdSense and subscribe to their service. Once more advantage of using Google AdSense is not having to contact the sponsors to get them to advertise on your site. Since the WordPress food blog theme is Google AdSense ready, you can display advertisements wherever you want on your site, very easily. Know more about Google AdSense. Another easy way to make money through your WordPress food blog website is by displaying advertisement banners on your site. These are the direct advertisements and can be about ingredients you talk about, places to eat at, or a raw materials’ store. Once your blog starts getting enough traction, local food related business may be interested in promoting their products through your website. You can charge differently to the advertisers based on the location of the advertisements. The ads displayed at the prominent places like header, below banner or among the content area can be charged more. While those at the footer or beneath sidebar can cost relatively less. The advertising strategy can be yours. Write promotional posts on your food blog. Such promotional posts can be about any food product, or a diner, or anything related to the niche of your food blog. Generally, these are the blogs/articles that explains (or talks about a product or service), but are paid for, by the sponsors. You can approach the brands/product manufacturers who might want to have a sponsored blog post on your website and ask them if they are interested. Don’t forget to make sure that the information that the promoted blog post supplies is 100% true and reliable. Also, you must mention at the top of the article that the blog post is a promoted/sponsored one. People are accustomed to buying online now. This is a technologically advanced world and eCommerce plays an important part in our day to day life. The Food Blog WordPress theme is an eCommerce ready theme and you can create an online store running parallely to your blog site. Using this feature, create attractive shop pages, or use the WooCommerce widgets to show products on sale. Once your site is ready and running, you should keep it well maintained to make sure it’s quality doesn’t suffer over time. Maintenance is important because it includes checking your website for defects & weaknesses and fixing them. The following are some common maintenance routines for your WordPress food recipe websites. A blog website is different than a business website because it needs to be updated regularly. To keep your website running and active, it is essential to keep writing and updating your site with fresh new content once in a while. Especially when it comes to a recipe blog, you must write regularly to keep your readers posted with new recipes. So make sure you keep posting new recipes or other articles under different categories to keep your readers updated. This not just keeps your readers interested in your site but also helps build your website’s reputation on the internet. Also, more blog means more chances to score a rank on the search engine amongst your competitors. Comments on your website are a very positive signal since they signal user engagement. One of the most important maintenance tasks is to check on what your readers have to say. Here, first of all, you have to make sure that comments are enabled on your site. Check if they are disabled and enable them if required. Research, analyze study statistics and find out all the best ways that work for your site. The best promotional techniques, the best way to write so as to engage more users, etc. Ultimately, keep an eye on your website’s performance through some tool like Google Analytics and draw useful conclusions. Over time, find out the strength and weaknesses of your website and work on them. There’s no specific guidance on what could work for your recipe blog. Because even if you follow the same niche: Food blogging, there can be a vast difference between your target audience, an area of operation, etc. And based on many diverse factors, your website’s requirements and functions may totally vary. However, know what works best for your site, how to attract readers and inspire them to take the required action can be learned through experience. Mostly all of the tasks after your start a blog are redundant. Especially promotions of your site is nothing sort of a one time task. You will have to renew your promotional efforts for every post you create. If you insist on create an SEO friendly post (which you should), you will need research and analysis for each of the posts. Because only a properly planned and structured post makes it to the first page of the search engine result page for a competitive keyword. Also, for an individual post, you need to share on Social media. Therefore, promotional work for your food blog never stops. There can be many other maintenance tasks to maintain your website’s performance. However, below mentioned are a few basic but important maintenance routines that must be followed. Regular SEO audits: To check the performance of various pages on the search engine. A visibility test for your individual pages as well as your site as a whole. Security checkups: To make sure that your site is free of virus/malware, user data(if any) is protected and your site is not vulnerable to any threat from hackers. Site backup: Regular backing up your site is the most important maintenance task. Backup is your only hope when your site crashes, or is hacked or in case of technical glitches. Website cleanup: Removal of unnecessary clutter from your website in form of data, files, plugins, etc. Software updates: Software updates are not just bug fixes, but sometimes enhancements to the base software on which your site is built. Don’t forget to update WordPress, your theme and plugins whenever an update is released. Ready to start a food blog now? These were the simple and easy steps to start a food blog website on your own. Creating and maintaining your site on your own has advantages of its own. You can personalize it and give it the personal touch and post recipes and share them easily with your readers. When you use the WordPress theme to start your blog, it is as easy as using a mobile application. You can install it and start customizing it with the very intuitive options, make it look and work exactly the way you want. No need to hire professionals to get your food blog live. So, are you ready to launch your food blog now. Before you begin with your blog, we suggest you to read: Blogging for beginners: How To Start a Blog, Promote, Maintain & Sustain It in 2018?